The Monster Energy Cup Series will head to Richmond, Virginia this week for the Toyota Owners 400. This will be the first Saturday night race of the season. The track is a .75-mile D-shaped oval that usually provides some exciting racing. The race can be seen Saturday night at 7:30 p.m. ET on Fox. NASCAR will have a condensed schedule this week. 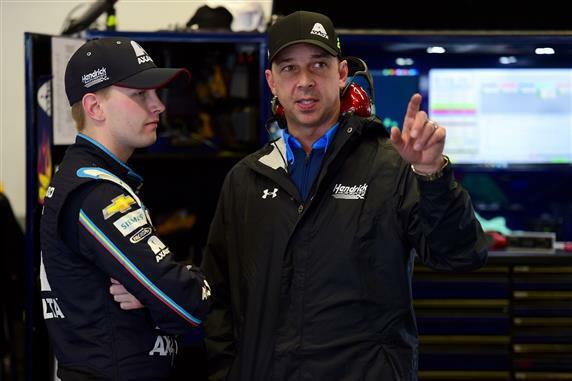 There were two MENCS practices and one Xfinity Series practice for two-hours Friday. Qualifying for both series will be Friday evening. That is a lot of on track activity. And to promote their sport NASCAR decided not to televise any of the practice. No wonder the seats are empty. Goodyear brought a new set of tires to Richmond. They will be used in both the Xfinity and MENCS races. Richmond is one of the higher tire wear tracks on the circuit so Goodyear wanted a tire that would put rubber on the track and last the full length of a long green flag run. Each team will get 3 sets of tires for practice, 1 for qualifying and 10 sets for the race. The MENCS will use the 750 Horsepower engines with the 2” spoiler and 8” spoiler and no aero duct. This package has been used at Phoenix, Martinsville and Bristol. Only 3 drivers have finished each of the 3 races using this aero package in the top 5. They are Kyle Busch, Denny Hamlin and Ryan Blaney. * NASCAR will have a prerace inspection Saturday at 1:30 p.m. ET (It should be complete by 3:30 p.m. ET). Any cars who fail will go to the back and be scored from the back because their qualifying time will be disallowed. If I need to update my picks I will repost them Saturday evening. Kurt Busch: Busch is off to a hot start in 2019. He has 6 finishes in the top 10. His only problem is qualifying. If he ever starts up front Busch will probably win more races. Last year Busch led 98 laps, scored 7 Stage points and finished 11th in this race. He is running as well now, if not better than he was at this time last year. He should be a driver who spends a lot of time in the top 10 Saturday night. Kurt told his team, “The front left is really bouncing on the track.” The team made a shock adjustment. After his final run Busch said, “I am not going to complain about it. It is good.” The No. 41 team has the lead engine from Martin Truex Jr.’s team from last year. He really knows how to set up cars for this track. Daniel Suarez: Suarez is one of the surprise stories of the 2019 season. Most people did not pick him to be a top 10 driver but he has 3 consecutive finishes in the top 10 entering Saturday night’s race. Last year Suarez finished 10th in the spring and 17th in the fall at Richmond while driving for Joe Gibbs Racing. He should be better than that Saturday night. Paul Menard: Menard is another driver who typically does not run well at Richmond. Since the night race in 2015 Menard has a 26.7 average finishing position at the track. None of those races resulted in top 20 finishes. Menard was fighting a tight racecar that “pushes up the track” in practice. Kyle Busch: Should we just give the trophy to Busch won so we can all get to bed early Saturday night? He is blazing hot this season. 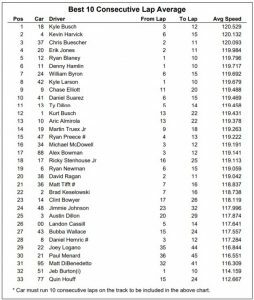 Busch has 3 wins this season, finished every race in the top 10, won the race at Phoenix (most similar track to Richmond) and he won the last 2 races at Richmond. This is as close as we will get to having a lock to win a race this season. 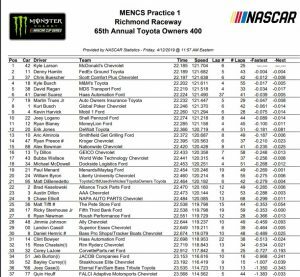 Busch was quiet on the radio in practice. He made a lot of long runs so that tells me they are pretty happy with the car. Denny Hamlin: Hamlin will be looking for his 4th win at his home track this week and his 3rd win of the season. Hamlin is off to a hot start in 2019. He has finished every race in the top 11 and he has finished 5 of the last 6 races in the top 5. Hamlin has a 5.7 average finishing position in his last 7 races at Richmond so he should be up front Saturday night. Hamlin really liked his car in practice. They brought it in the garage and only made some air-pressure adjustments. Hamlin also spent a lot of time working on pit road speed. Martin Truex Jr.: Truex dominated 3 of the last 4 Richmond races. He led 163 laps last September, 121 laps last April, 198 laps in the fall of 2017 and 193 laps in the fall of 2016. Truex also finished 2nd at Phoenix this year (similar track to Richmond). This could be the breakout race for the No. 19 team. Truex seemed happy with his car. The team told the MRN reporter that they were more concerned with their night time speed that at the start of the race. That is what they spent the practice sessions working on. Matt DiBendetto: DiBenedetto will have some momentum after his strong run at Bristol. He hasn’t had much success at this track before but his car will be a lot faster than what he drove in the past. Also, crew chief Mike Wheeler has had a lot of success at this track so his car should be able to adapt to the changing track conditions Saturday night. Daniel Hemric: Hemric is a rookie but he did drive in the MENCS race at Richmond last year. Hemric qualified 22nd and finished 32nd. He should be a lot better than that with his full-time team this week. Crew chief Luke Lambert is known for steeling track position by using strategy in this race. I expect the No. 8 team to do that Saturday night. Austin Dillon: The No. 3 car has had speed this year but Dillon has had a problem bringing it home in the top 10. His average running position is 11.2 and his average finishing position in 15.9. Dillon did run well in the last night race at Richmond. He qualified 26th and finished 6th. He said on Fox Sports RaceHub this week that he learned a lot a Richmond last year so he enters the race Saturday night with a lot of confidence. Ryan Preece: Preece has never run a MENCS race at Richmond but he does have 3 races in the Xfinity Series at the track on his resume. Preece finished 18th, 26th and 23rd in those 3 races. Preece did not have any luck at Phoenix either this season. He qualified 21st and finished 34th. * Final Practice was canceled because of rain.